"Stan, you heard the sausage. You're 2 for 58." Pitchers and catchers report in a couple weeks, and there are nine inches of snow on the ground in Wisconsin, so any kind of baseball movie feels like a treat. It doesn't have to be great, and it doesn't even have to deliver a lot of surprises. It just has to smell like a ballpark. Mr. 3000 makes the roster, without stretching the genre too much. 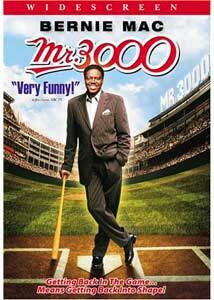 Bernie Mac stars as Stan Ross, a ballplayer with an oversized ego, whose team spirit is summed up when he climbs into the stands and pulls his 3000th-hit ball out of an incredulous kid's hands. Stan immediately retires from the Milwaukee Brewers the instant he scores 3000 hits, assuring his spot in the Hall of Fame, without helping his team finish the season in a pennant race. That attitude follows him and helps prevent him from getting into the Hall of Fame and doing anything more important than running a tacky strip mall of loser businesses, all trading on the "Mr. 3000" theme. When the record-keepers determine that three of his 3,000 hits were never actually earned due to a scoring error, Stan finds himself back in a Brewers uniform in a quest to get those three last hits at age 47. Stan learns a few things the second time around, and so do his teammates. Don't look for great complexity in the plot, but it's generally serviceable even if it's a little predictable at times. There's a nice bow to realism in that Stan's participation doesn't mean the possibility of a pennant, but the team's goal is the more modest one of somehow clawing its way into third place at the end of the season. The business end of baseball is emphasized in the desire of general manager Schembri (Chris Noth) to bench Stan while the team is on the road so he can sell more tickets as the veteran tries to get to the magical number 3000. The picture is really Brewer-centric, which seems an odd choice unless it was a requirement of commissioner Bud Selig, their former owner. No doubt that setting contributed to the film's shabby performance at the box office. But in general the atmosphere of Miller Park is nicely created, right down to the fact that the most enjoyable part of any Brewer game is the sausage race. No actual Brewers are seen on screen, however, which is probably just as well. The only serious locale flaws are that Brewers fans don't actually use thundersticks (how would you hold your beer? ), and the mispronunciation of Waukesha as Wau-KEE-sha. Really, would it have been that tough to ask a local? Bernie Mac does a fine job of portraying the ego, flash, and sass that are part of any high-visibility industry, combining smarminess and being a complete jerk with the necessary charisma and charm that keeps him from being tarred and feathered. He's particularly good with the emotional core of the character, as he comes to grips with the notion that his age and dissipation have caught up with his innate talent. His chemistry with romantic interest Maureen Simmons (Angela Bassett) is off and on, and she isn't terribly appealing with her rather shrill portrayal of an ESPN reporter who has a history with Stan. Paul Sorvino's role as the manager, Gus Panos, is particularly odd, given that until nearly the end his part is completely silent. Michael Rispoli as Boca, Stan's confidante and whipping boy, and Bruce White as young slugger T. Rex Pennebaker are particularly likeable and believable. They make a good counterpoint to Stan's egotism, even though Pennebaker shows incipient signs of developing the same destructive self-obsession. The ensemble does a decent job of energizing and gelling as a team, helping remind one stuck in snowbound Wisconsin of the eternal feel-good game of summer. Image Transfer Review: The anamorphic widescreen picture generally looks okay, but it's much too processed without any good reason. There's a ton of filtering, so detail is lost, and then electronic sharpening is applied liberally in a misguided attempt to get some of that back. The result is pretty ugly. Colors are vigorous and black levels are healthy, as one would expect. Audio Transfer Review: Dual DD and DTS audio tracks are provided, and both sound fine. In particular, the ballpark sequences have excellent immersing qualities and good use of the surrounds. Hiss and noise are nonexistent, as it should be on a new film of this kind. Extras Review: Touchstone provides a packed special edition for this box office disappointment, apparently in an effort to make up for that in DVD sales. There's a pedestrian "making of" that runs just 15 minutes, and a more entertaining featurette on the extras who were called upon to be major leaguers for a few days. Everybody Loves Stan is a collection of longer clips of sportscasters and others ripping Stan Ross even more, and three extended sequences (with a Play All feature) gives longer looks at a Sportscenter segment, the Leno interview and the Mr. 3000 advertisement featured prominently in the early part of the film. Three deleted scenes (again with a Play All) include an EA commercial, Stan's physical, and two ballplayers quizzing each other on soap operas. The last of these includes a director commentary, which explains the in-joke behind this segment. A 3m:20s set of outtakes is pretty funny. Director Charles Stone III contributes a full-length commentary, and although he avoids dead spots and narration for the most part, he doesn't have a lot of interesting material to provide and largely just goes on about how great the various cast members are. Two trailers for unrelated films are included, but for some reason there's no trailer for the feature itself. This is a fun flick with few flaws (the worst, a CGI insert of a home run), but with a big heart, reasonably good acting and the feel of peanut shell dust by your feet. If you like baseball, you won't have wasted your time. If you don't care about baseball, you'll still have a reasonably fun evening. Other than some unnecessarily rough language, this would have made a pretty good family film. As it is, take the PG-13 rating seriously.